On this Best of Britain & Ireland tour, see Britain’s and Ireland’s highlights—from the bustling cities to the small towns and from the breathtaking scenery to the ancient ruins. Traveling through the lands of queens, kings, and leprechauns, begin and end in London and pass through England, Scotland, Ireland, and Wales. 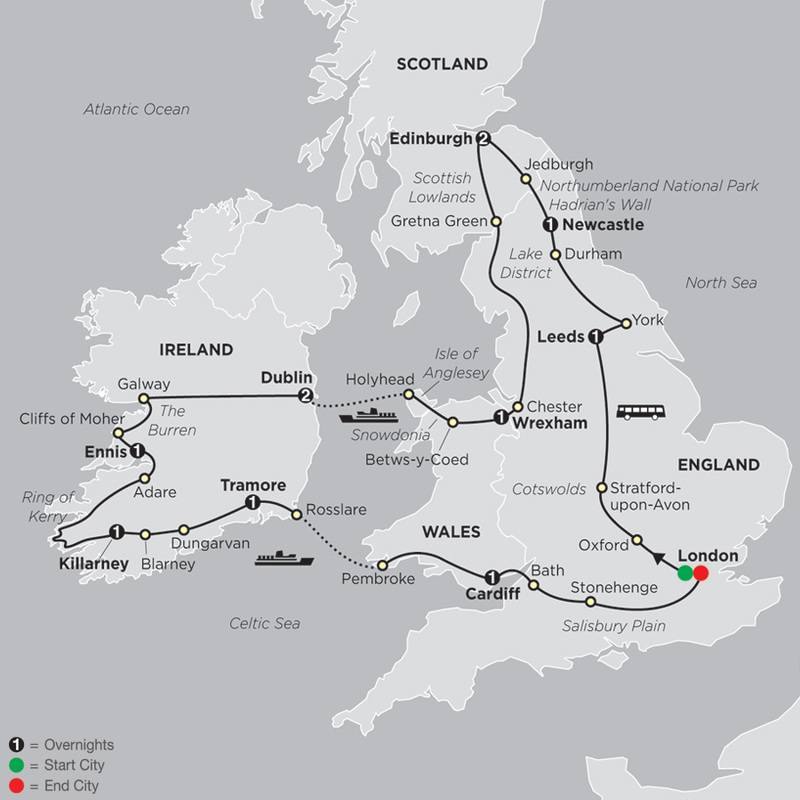 On this affordable tour of Britain and Ireland, stop in some historic towns, including Oxford, home to some of England’s most famous colleges; Durham, a medieval city with its cathedral, built in 1093, and castle, a UNESCO World Heritage Site; York, England's most complete medieval city with its cobbled streets and the magnificent York Minster, England’s largest gothic cathedral; Stratford-upon-Avon, birthplace of Shakespeare; Chester, where a walking tour highlights its Roman remains and black and white half-timbered buildings; Adare, founded in medieval times and known today as one of Ireland’s prettiest villages; and Bath, known for the excavations of Roman baths used for bathing and socializing 2,000 years ago. Britain and Ireland are known for their green countryside and stunning scenery, and on this Britain and Ireland budget vacation, you’ll witness some of their gorgeous landscapes. Travel through the incomparable landscapes of Snowdonia National Park in Wales, with picturesque villages, mountains, and lakes. Follow Ireland’s Ring of Kerry, a 100-mile panoramic drive with sparkling seascapes, brightly colored farmhouses, and the breathtaking panorama of the Lakes of Killarney. Visit the spectacular 668-feet Cliffs of Moher, with breathtaking views of rugged cliffs dropping into the ocean. Drive through the Cotswolds, with the rolling hills and picturesque villages, Northumberland National Park, with its wide-open spaces, and the serene Lake District, England’s largest natural park. All of this and more—including time in Dublin and Edinburgh—await you on this marvelous vacation! LONDON–OXFORD–STRATFORD-UPON-AVON–LEEDS. Meet your Tour Director and traveling companions and depart at 8 am for Oxford. A walking tour takes in the colleges where Britain’s elite receive their outstanding education. Then, travel through the lovely Cotswold Hills to Shakespeare’s Stratford-upon-Avon. Take photos of Anne Hathaway’s Cottage and explore the town at your own pace. Your overnight destination is Leeds. LEEDS–YORK–DURHAM–NEWCASTLE. This morning, head north to York. Stand in front of the great structure of York Minster, then follow your Tour Director through a maze of quaint streets, including the narrow Shambles. Next, visit Durham, a captivating city with its dramatic cathedral and castle, a UNESCO World Heritage Site. Stop for the night in Newcastle. NEWCASTLE–JEDBURGH, SCOTLAND–EDINBURGH. See a section of Hadrian’s Wall, then motor through wild Northumberland National Park to the Scottish border. Stop for photos at Jedburgh before arriving in Edinburgh. Here, sightseeing with a Local Guide introduces you to the 200-year-old “New Town.” In the “Old Town,” visit EDINBURGH CASTLE to admire Scotland’s Crown Jewels. A suggestion for this evening: a traditional Scottish night out with Highland dancers, bagpipers, and, of course, the Ceremony of the Haggis. EDINBURGH. Your choice today: an optional morning excursion to Rosslyn Chapel, made world-famous by Dan Brown’s Da Vinci Code, and also one of Scotland’s most remarkable buildings. You will have ample time to visit the 15th-century medieval chapel and the visitor center, and to take photographs of the ruins of Rosslyn Castle. Later, another unique optional opportunity: board the former Royal Yacht Britannia, which was once the perfect royal residence for glittering state visits and family holidays. Tour five decks and see how the Royal Family and crew of 240 lived and worked on board. Dinner rounds off this optional evening. For departure numbers July 28 and August 11, tickets are included for tonight’s performance of the world-renowned MILITARY TATTOO. WREXHAM–BETWS-Y-COED–DUBLIN, IRELAND. A scenic North Wales drive through the incomparable landscapes of Snowdonia National Park brings you to lovely Betws-y-Coed. Then, head over spectacular Llanberis Pass and, finally, across Britannia Bridge to the Isle of Anglesey. Take your photos at tongue-twisting Llanfair; and at Holyhead, board the ferry for the Irish Sea crossing to Dublin. DUBLIN. A day in the “Fair City” starts off with an orientation drive through Eire’s capital and includes statue-lined O’Connell Street, elegant Georgian squares, and St. Patrick’s Cathedral. The rest of the day is free for you to enjoy Dublin at leisure. Why not join an optional dinner evening at the Guinness Storehouse? DUBLIN–GALWAY–CLIFFS OF MOHER–ENNIS. Head for dairy farm country in the center of the “Emerald Isle.” Stop in Galway, a popular seaside destination and a buzzing cosmopolitan center with colorful shops and a busy café and bar culture. Then, cross the limestone plateau of The Burren to visit the spectacular 668-foot CLIFFS OF MOHER before heading for Ennis, county town of Clare. Tonight’s optional opportunity: a medieval banquet at a historic castle. ENNIS–ADARE–RING OF KERRY–KILLARNEY. Stop for photos in Adare, a village known for its prize-winning thatched cottages and monastic ruins. In County Kerry, join the road known as the RING OF KERRY for a 100-mile coastal panoramic drive. Focus your camera on sparkling seascapes, mountains dotted with brightly colored farmhouses, winding lanes, and views of the Lakes of Killarney from Ladies View. Later, in Killarney, discover why this is such a popular resort. KILLARNEY–BLARNEY–DUNGARVAN–TRAMORE. Across the Kerry Mountains and through County Cork to Blarney, famous for its magical Stone of Eloquence. Time to see the castle, and shop for Irish crafts and handmade crystal. After lunch, drive past Cork, the country’s second-largest city, and via Dungarvan to Tramore. Why not join an optional pub tour before dinner at your hotel? TRAMORE–CARDIFF, WALES. An early start for the short drive to Rosslare. In just under four hours, you cross St. George’s Channel by FERRY to South Wales. Continue through rich dairy farmland to Cardiff, where an orientation drive introduces you to the capital’s major attractions: Cardiff Castle, Cathays Park, Millennium Stadium, and the stately civic buildings. Tonight, why not join an evening of Welsh entertainment and dinner? CARDIFF–BATH, ENGLAND–STONEHENGE–LONDON. A day packed with highlights begins as you cross the spectacular Severn Bridge into England. Stop in the elegant Georgian city of Bath, famous for its Roman relics, before visiting STONEHENGE, still an intriguing mystery. Explore the visitor center with its imaginative exhibitions, then admire the magnificence of the monument up close. Return to London around 3:30 pm, where your holiday ends. "I so enjoy the opportunity to share landscapes and cultures. Packed into my tiny part of the world is a depth and breadth of geographical and historical variety that simply cannot be surpassed." "I have always loved to share my passion and knowledge for the British Isles with friends from all over the world, showing them first my home town and then my country. Great Britain and Ireland offer you all you could imagine and more; hear about it whilst you admire their outstanding natural beauty."